Science After Retirement: What are the relative contributions of the primary drivers to patterns of variation of soil moisture? What are the relative contributions of the primary drivers to patterns of variation of soil moisture? In previous blog posts, I have presented methods for estimation of the relative contributions of rainfall events, infiltration, and evapotranspiration on soil moisture dynamics in the Vacant to Vibrant parcels. This blog post presents the results of applying these methods to experimental and control parcels in Gary, Indiana’s Aetna neighborhood. Preliminary observations (here) indicated that the immediate rate of decline following a rainfall event is a function of the soil moisture gradient and the permeability of the soil. Figure 1 shows the results of full analysis of the relation between the increment of soil moisture following a rainfall event and the subsequent first order rate of decline for the period April 21 to July 10, 2016. For these analyses, I omitted the soil moisture increments associated with diurnal variation in soil temperature. The resulting subset of soil moisture increments align with precipitation events recorded at the nearby US Weather Station (KGYY) or the project’s Aetna weather station, which started monitoring on June 15, 2016 (Figure 2). All three rain garden parcels showed a negative relation between rate of decline and soil moisture increment. 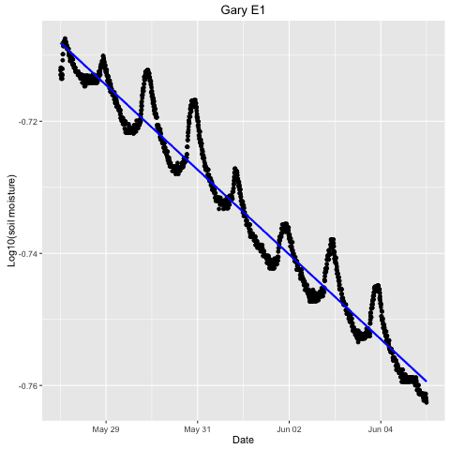 The relation for both Gary E1 and E3 parcels were highly significant (p < 0.001). In contrast, the control parcel had a non-significant positive association. Parcels E1 (mean 0.18 m3/m3) and E3 (mean 0.11 m3/m3) had lower soil moisture (Figure 2) with parcel E2 (mean 0.23 m3/m3) having the highest average soil moisture over this period. Because the rain gardens were filled with a high porosity soil, it is not surprising that the rain garden parcels should have higher rates of infiltration (indicated by the negative value of the estimated rate coefficient) than the more compacted soil of the control parcel and that the rate of infiltration declines as soil moisture approaches saturated values (0.3 to 0.5 m3/m3 depending upon soil composition for the probes used in this study). Figure 1. 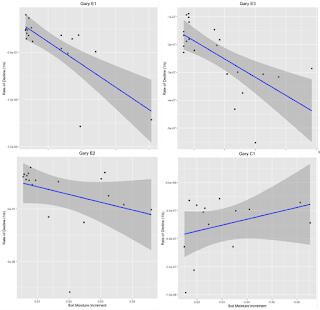 Comparison of relation between soil moisture increment and rate of decline for four Aetna parcels, Gary E1 (r: -0.76, p value: < 0.001, slope: -1.198e-05), Gary E2 (r: -0.34, p value: 0.17 slope: -7.39e-06), Gary E3(r: -0.67, p value < 0.001, slope: -1.31e-05), and Gary C1(r: 0.33, p value: 0.25, slope: 5.27e-06). Only data for soil moisture increments greater than the third quartile were included in the analysis to remove soil moisture increments associated with diurnal variation in soil temperature. Figure 2. Comparison of soil moisture time series (A), with precipitation measured by the U.S. Weather Service (B, station KGYY), and a remote weather station (C) installed in Aetna, June 15, 2016. The effects of evaporation and transpiration appear in the intervals between rainfall events. 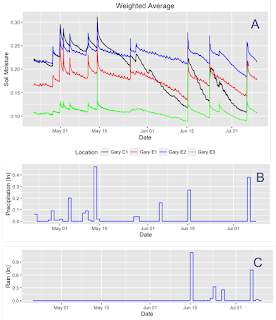 Upon examination of the trends in soil moisture (figure 2A), I selected three intervals for analysis of inter-event loss of soil moisture: May 28 to June 5, June 6 to June 15, and June 27 to July 6, 2016. Figure 3 is an example of the time series that I obtained. 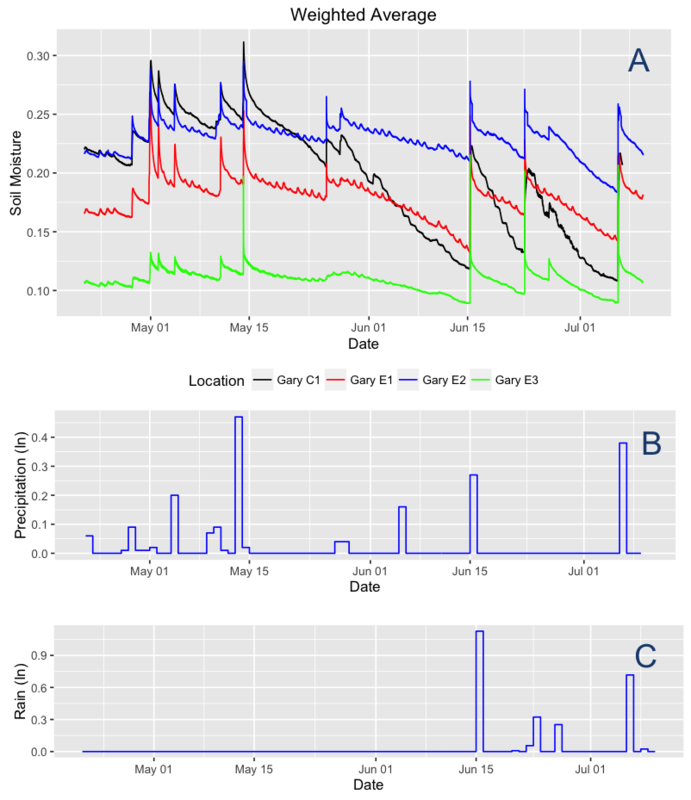 These time series show the pattern of diurnal variability in soil moisture during a decline. Using a simple linear regression of the log transformed soil moisture data produces an estimate of the loss rate due to evapotranspiration. Table 1 summarizes data for each of the parcels for each of the analysis intervals. The last column of Table 1 converts the observed rates of decline into an estimated monthly loss rate for the upper 20 cm of the monitored soil profile. The US Climate Prediction Center’s calculation of evaporation for June 2016 in northern Indiana is in the 60 to 80 mm/mo range. The estimates in Table 1 indicate that the control parcel has soil moisture loss rate greater than calculated evaporation rates and that the rain garden parcels have lower rates of loss than calculated evaporation rates. The control parcel in Gary has a well established mixture of grass and forb vegetation with periodic mowing. In contrast, the rain gardens have a less dense mixture of recently planted rain garden vegetation. Thus, it seems reasonable to expect the control parcels to have greater evapotranspiration rates than the rain gardens. Figure 3. Sample time series of soil moisture decline observed from May 28 to June 5 in the Gary E1 parcel. Table 1. Summary of rates of decline for the periods May 28 to June 5, June 6 to June 15, and June 27 to July 6, 2016, in the four Gary parcels of the Vacant to Vibrant project. Overall, it appears that the methods of analyzing patterns in the variation of soil moisture provide reasonable approaches to estimating infiltration and evapotranspiration in parcels of the Vacant to Vibrant project. Loss of the monitoring station in the Gary control parcel on July 9 complicates future analysis of the Gary data. Lack of major rainfall events in Buffalo and Cleveland limits analysis of these parcels for 2016. Nevertheless, differences in soil types and vegetation of these other parcels will provide greater contrast for future analyses.